Become a designer and make the world a better place. Massey’s College of Creative Arts in Wellington offers a broad range of programmes in Fashion design, Industrial design, Photography, Spatial design, Textile design, and Visual Communication design. With a history that can be traced back to 1886, our School of Design is the largest design school in NZ, and has produced many of our country’s most renowned designers. All design degree students enrol in honours. Towards the end of third year, you decide whether you want to stick with the honours route, where your 4th year will be strongly research-led. The non-honours path is less research-focused and gives you room for more electives in 4th year. As a Massey design student, you will spend most of your time making and thinking in studios, workshops and media labs, whatever your major. There are many opportunities to explore other design fields through electives and cross-disciplinary collaboration is encouraged. There is also a focus on real world problem-solving and students in their 4th year have the opportunity to engage with live briefs and external clients. Massey University offers a range of scholarships for high achievers. Find out more about creative arts scholarships. Selection for the design degree is by portfolio, but high-achieving students may be eligible for automatic entry. The application due date is 1 October each year. Late applications will be considered if space is available. See the College of Creative Arts website for more detail. Here’s what happens when a community’s vision is put in the hands of talented designers. 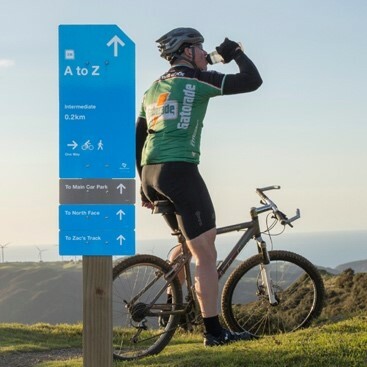 Bachelor of Design honours students, Josie Schultz, Steph Tidey, Rachael Jupp, Rhianna Field and Oliver Ward were tasked with helping to make the Makara Peak Mountain Bike Park more inclusive for new mountain bikers and walkers, while maintaining the area’s strong conservation values. The project won two Designers’ Institute Best Awards in 2015 and in 2017 won a Merit award from the Society for Experiential Graphic Design (SEGD) in Seattle. “The 12 week project was completed within the Creative Enterprise paper, where a client comes to Massey with a strategic problem or opportunity, and students decide how to address it with a design solution,” said Oliver Ward. The client for this project was the Makara Peak Supporters group. Rhianna Field said, “We rode the park and got lost, so came back with a way-showing system which drew from the visual language of ski fields and an international sign language." “The Council initially only had money for signage to go in a new entranceway from the carpark, but the Supporters group did some fundraising and in the following year Rhianna and I worked out the plan for 500 signs to be installed by volunteers - that happened the year after we graduated,” Oliver said. The result was a client “blown away” by what the student designers achieved, users giving them great feedback and the Council is over the moon. So much so they have come back to the School of Design with many other live projects. The Wainuiomata and Colonial Knob mountain bike parks have both been inspired by the Massey students’ design. There is a real opportunity in New Zealand to spread the system and it has already been installed on Waiheke Island as a result of our Makara work,” Oliver said. The 21st century is already rewarding people who are creative, innovative and engaged. Graduates leave the College of Creative Arts with a portfolio of creative design work, solid technical and analytic skills, a strong research ethos, and a great network. Our design graduates are sought after by employers in a range of industry, business, and marketing-related activities, with 93% employed in relevant industries within 6 months of completing their degree. Some also continue to postgraduate study in New Zealand or overseas, including the MFA in Design and the Master of Design at Massey.